So much is happening on Agents Of S.H.I.E.L.D. 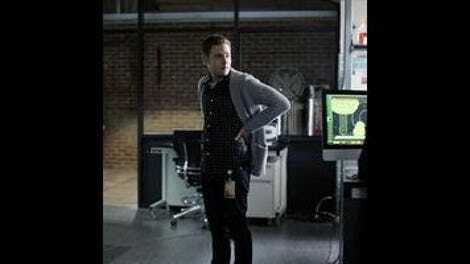 that three episodes have passed since we last saw regular character Grant Ward, and his reappearance this week is far from the most pressing storyline in “Love In The Time Of Hydra.” As Coulson and his team continue to fret about how to handle Skye’s new powers, “the real S.H.I.E.L.D.” has entered the fray and is making its play against the rogue faction that is getting more dangerous with every passing day. Raina, Cal, and Gordon are nowhere to be seen this week, and the Inhuman thread takes a backseat to the spy organization intrigue, which intensifies as Bobbi and Mac start to lose grip on their covers. It’s a place-setting episode that is mostly focused on establishing the conflict that will explode next week, but it has some strong character moments, fleshing out some old relationships and building up a new one for Ward and Agent 33. The action begins with the two former Hydra agents sitting in a diner, chumming it up before pulling out their guns and abducting a man that can fix Agent 33’s defective nanomask. The nanomask is writer Brent Fletcher’s way of exploring Ward’s different relationships with the main women in his life—well, his life on this series at least—and before finally regaining her old face in the episode’s final moments, Agent 33 stands in for both May and Skye. His relationship with May represents his relationship with S.H.I.E.L.D., and the scar on May-gent 33’s face is a visual indicator of how that relationship has been forever changed. While he had a sexual relationship with May, she didn’t have his heart like Skye, and Agent 33’s Skye roleplay gets Ward to expose his feelings about recent developments in his dysfunctional love life. He tells his partner that Skye made it pretty clear that she wants nothing to do with him when she shot him, and he’s not insane so he got the hint. The problem is that Ward kind of is insane, so I doubt that his feelings for Skye have truly subsided. We’ve seen that Ward is dedicated to his own personal agenda, and it’s likely that Agent 33 is just another pawn. He sees someone vulnerable that could be a valuable ally, and he lures her into his web by helping her rediscover her strength and identity. He helps her break Sunil Bakshi out of prison, and after Agent 33 has tortured the man that ruined her life, she’s able to share her true name and face with Ward. Kara is falling in love, and the deeper she falls, the easier it is for Ward to manipulate her. Kara and Ward are wild cards, and it’s not clear how they fit into the larger narrative at the end of this episode. Their story is tangential, although having Skye and May’s faces on Agent 33 makes it feel like Ward is interacting with the rest of the cast. (It also gives Ming-Na Wen and Chloe Bennet the opportunity to play different characters, which is always fun on genre TV shows.) While I’d rather see more time spent on the Inhumans, which are being very slowly teased, I appreciate that this show has grown to the point where it has these different subplots and side characters. That means that certain stories need a check-in every so often, and while “Love In The Time Of Hydra” isn’t as engaging as the last few episodes, it’s still a solid primer on Ward that puts him on a new path, one that will inevitably intersect with Coulson by the end of the season. This show’s sudden interest in S.H.I.E.L.D.’s “Index” of enhanced beings is likely setting up next summer’s Captain America: Civil War, which will deal with the governments of the world passing an act designed to regulate all superhuman activity. There’s been an increase in paranoia regarding the rise in superpowered individuals, and Robert Gonzales (Edward James Olmos) thinks that S.H.I.E.L.D. should be containing that power rather than activating it like Coulson’s group. Bobbi and Mack have been leaking intel to Gonzales while under Coulson’s employ, and by the end of the episode, they’re ready to make their move against their old friends. “The real S.H.I.E.L.D.” plot moves very quickly, and the script could do a better job showing why Bobbi in particular is so committed to Gonzales’ cause. We’ve seen that Mack shares Gonzales’ viewpoint regarding the role of superhumans in society, but what about Bobbi? It’s possible that the writers want her to be a mystery, but if they are going to accelerate the narrative, they need to establish a framework that can support the speed. That means solidifying character intentions, and right now I don’t know why Bobbi has chosen to be in her current position. I do know that the preview for next week’s episode has a May versus Bobbi showdown, so I’m excited to see what Mockingbird has in store for us. Gonzalez’s concerns are shared by Simmons, and I’m beginning to think that she’s going to jump ship and side with Bobbi when the two factions of S.H.I.E.L.D. collide next week. Simmons isn’t comfortable with Coulson’s tactics, wants to find ways to suppress superpowers, and owes her life to Bobbi, who saved her from behind enemy lines, so if “the real S.H.I.E.L.D.” made an offer, it wouldn’t be a surprise if Simmons accepts. 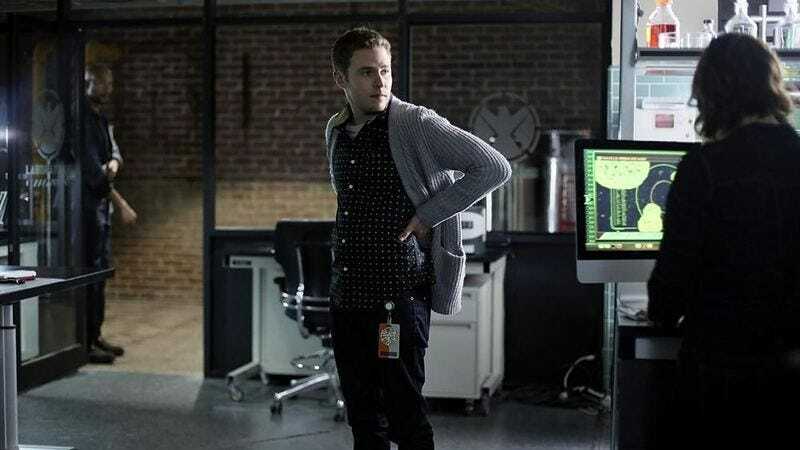 That would be another major blow to Coulson’s crew, which is steadily losing members following Trip’s death, Skye’s transformation, and Lance’s abduction. Taking Andrew’s advice from last week, Coulson removes Skye from active duty and relocates her to one of Nick Fury’s safe houses so she can heal and hopefully gain a better handle on her powers. Coulson and Skye’s scenes together spotlight the strong bond Clark Gregg and Chloe Bennet have built over the course of the series. Bennet is becoming a lot more comfortable in Skye’s skin now that her character’s true identity is out in the open, and the father-daughter dynamic between Coulson and Skye is even stronger now that Bennet’s performance has more depth. Coulson’s speech about working on a ’62 Corvette with his father as a child is a nice soft moment between him and Skye, and there’s a lot of compassion in Gregg’s performance that directly contradicts the image of Coulson painted by Gonzalez. Coulson isn’t stockpiling superhuman weapons; he’s trying to help one of his family members. But in the world of paranoia and fear that is S.H.I.E.L.D., it’s easy to ignore that key difference if it means taking action and gaining power. Ruth Negga was recently cast as Tulip in AMC’s adaptation of the Vertigo comic Preacher, which is an unconventional choice for a character that is a blonde white woman in the comics. It’s also a very exciting decision considering Negga’s natural presence and strong acting skills, although hopefully it doesn’t mean Raina is leaving this show because she’s become my favorite character. I would not have pegged Lance Hunter for a Harry Potter guy, but his Hufflepuff reference suggests that he’s pretty comfortable with the franchise. I need more scenes of Fitz and Simmons arguing hypothetical situations involving the Avengers.